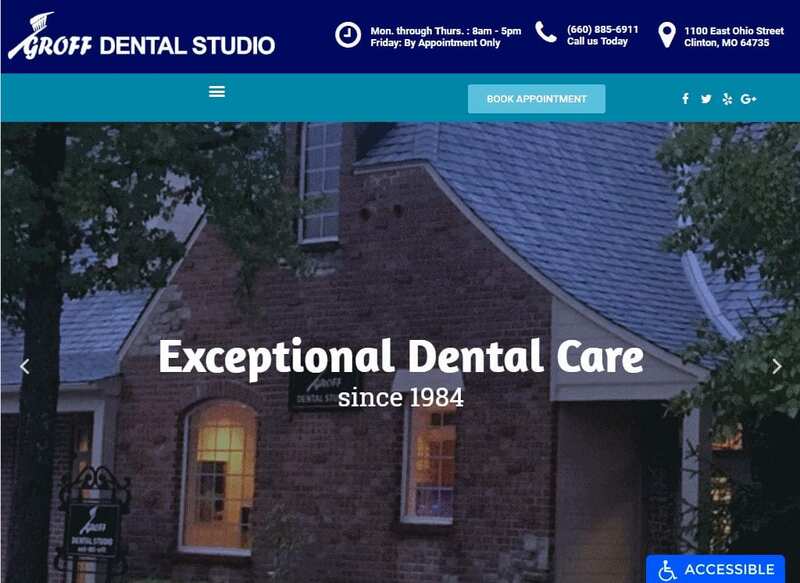 Groff Dental Studio has been serving its community since 1984, and Dr. Groff new it was time for a sleek updated website that would meet the needs of his clientele. He approached us looking for something fresh and new that would both touch on the personality of his office and touch the heart of his community. The result is a beautiful blue-toned site that is informational, accessible, and lightweight. The slideshow we’ve selected for the opening page is comprised of images of his facility and some of its interior. Throughout you can see the blue tone we used in the site echoed in the buildings aesthetic, along with the white palette we chose to compliment it. The layout was selected to make contact information immediately accessible while leaving the rest of the site easy to navigate. Blue stands out as the primary color used in this site’s design, with white primarily being used as an accent and for text. These colors are particularly popular in our medical website designs, including the work we do for dental sites. Blue’s welcoming and calming nature is a great way to combat anxiety in patients who are concerned about receiving dental treatment, while white helps accent everything else and lends an air of cleanliness and purity to the site. • Contrast – Blue in all its shades tends to contrast well with itself, and white helps this by accenting the text and breaking up the imagery. • Presentation and Visibility – Blue is also used throughout the site to highlight those areas that demand attention or provide useful information. From the blue view our services button to the areas containing working hours and other contact information, blue draws the eye and the viewer to action. While the initial opening page is fully packed with information, the rest of the site then opens up into a well spaced and easily digestible format. This combination of elements aids in navigation and getting visitors the information they want quickly. • Space – Space is used creatively throughout this site, allowing the presentation of a dense amount of information for the new client when they first visit the page, followed by an open and easy to follow format throughout. • Navigation – Navigation throughout the site is clean and easy thanks to the use of boxed in information and the hamburger menu being placed at the top of the first page. This allows a visitor to go directly to where they want to go or to scroll through the site as suits their preferences. • About Us – The About Us page on this site is one of the more robust designs that we’ve used, with additional imagery of the office combining with copious information about Dr. Groff and his team. The overall purpose of a website, outside of providing information, is to drive conversion of visitors into customers, regardless of the industry its built for. • Ease of Contact – Immediately upon landing on the site you are presented with the companies address, their phone number, and the appointment times for the site. These are some of the most important pieces of information to the average visitor and allows them to quickly act on their desire to make an appointment. • Navigation – Navigation plays an important role in a sites conversion rates, as ease of navigation and the ability to get to the information they’re looking for increases confidence in the visitor. • Testimonials – Testimonials are a great way to share what other customers have been saying about working with your office. This kind of word-of-mouth advertising is impossible to beat. A caring and welcoming site with an established reputation for professionalism and effectiveness. Throughout the site, the color scheme comes together well and provides information to the visitor in a clear and accessible way, while the robust About Us page gives a sense of transparency that can help a visitor get to know your staff.